“There is a logic to empire that differs from the logic of a nation, and acts committed in service to an empire but never acknowledged as such have a tendency to haunt the future” (p.8). 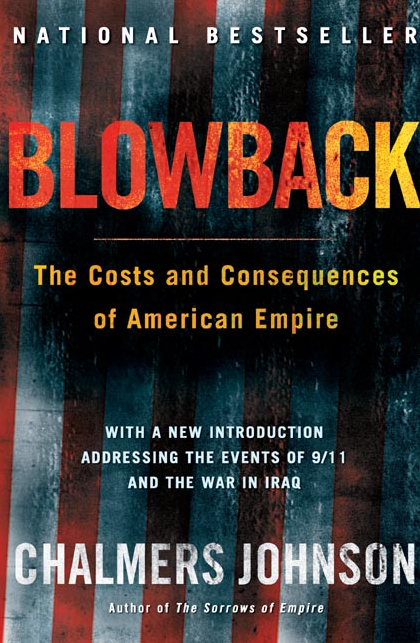 The first of an “unlikely” trilogy, Blowback documents the foreign policies and practices of successive U.S. administrations that have sown the seeds for future blowback. “In its narrowest sense, ‘blowback’ means the unintended and unexpected negative consequences of covert special operations that have been kept secret from the American people and, in most cases, from their elected representatives” (p.xi). Written before the terrorist attacks of September 11, 2001, and subsequently republished following its prescience, the book lays the groundwork for understanding the past, often hidden roots of contemporary violence. As an expert on Japan, the book’s focus is on U.S. policy in East Asia, particularly the garrisoning of Okinawa, Japan, and the “neo-colonial” economic policies pursued in South Korea. But above all, the text wrestles with the disastrous contradictions created by Cold War and post-Cold War strategies. In doing so, Johnson reveals how the U.S. and USSR often pursued similar policies—unleashed by a desire to control the world map after World War II. Instead of demobilizing following the collapse of the Soviet Union in 1991, the structures erected across the planet to “contain” communism were maintained, and often buttressed, by the U.S. military. The skeleton of empire Johnson discusses is the network of bases staffed by U.S. personnel. He identifies at least eight hundred foreign military bases, most of which were built during or following World War II. “At the height of the Cold War, the United States built a chain of military bases stretching from Korea and Japan through Taiwan, the Philippines, Thailand, and Australia to Saudi Arabia, Turkey, Greece, Italy, Spain, Portugal, Germany, England, and Iceland – in effect ringing the Soviet Union and China with literally thousands of overseas military installations. In Japan alone, immediately following the end of the Korean war, there were six hundred U.S. installations and approximately two hundred thousand troops” (p.37). Chapter 2, “Okinawa: Asia’s Last Colony”, discuses the historical roots of an island first invaded and occupied by the Japanese in the 17th century, and subsequently “sold off” to the Americans as part of Japan’s formal independence in 1952. As a prefecture of Japan, Okinawa only occupies 0.6 percent of the nation’s territory, but 75 percent of the U.S. armed forces are concentrated within it. The U.S. justifies its presence as either “defending” Japan or “containing” it, depending on the historical moment. This is despite the fact that mainland Japan has not been targeted for a ground invasion since a Mongol fleet was dispatched there in AD 1281. At the end of World War II, American military officers held Okinawa as their exclusive staging ground. The bases that stretch across the island were subsequently vital in the Korean War and Vietnam War. “By the late 1960s, the Americans had built their complex of more than a hundred bases, much of it by forcibly seizing land from defenceless Okinawans who were without official citizenship, legal protections, or rights of any sort from any country” (p.40). Johnson discusses several instances of sexual abuse and violence that were handled inappropriately by the military, as well as the use of depleted uranium for target practice. Often, suspects involved in off-base crimes were simply not prosecuted; a result of “extra-territoriality”, a form of legal impunity created by Americans that dates back to the Opium War of 1839-42. This precedent would wind its way into a watered down form of extra-territoriality in Article 17, section 5, of the Japan-U.S. Status of Forces Agreement (SOFA), which stipulated: “When U.S. servicemen and their families commit crimes, they shall be detained by U.S. authorities until Japanese law enforcement agencies file complaints with the persecutors’ office based on clear suspicion” (cited on p.45). Japan has paid the U.S. billions of dollars for expenses incurred at Okinawa. As Johnson goes on to argue, Japan has been a de facto “satellite” of the U.S.—a term usually describing the “people’s democracies” of the “evil empire”, namely East Germany, Poland, Czechoslovakia, Hungary, Romania, Albania, and Bulgaria. Johnson identifies Japan, South Korea, Thailand, South Vietnam, Laos, Cambodia, the Philippines and Taiwan as part of a constellation of Cold War territories that the U.S. directly influenced. While this “clash” of Soviet and U.S. empires may have made some degree of sense during the Cold War, after 1991, the U.S. retained its regime in East Asia, despite no discernible threat—real or imagined. And yet its system of satellites was strengthened. U.S. sponsored dictators in Asia include: Chiang Kai-shek and his son in Taiwan; Ferdinand Marcos in the Philippines; Ngo Dinh Diem, General Nguyen Kanh, Gneral Nguyen Cao ky, and General Nguyen Van Thieu in Vietnam; General Lon Nol in Cambodia; a range of rulers in Thailand; and General Suharto in Indonesia (brought to power with the help of the CIA and overthrown with the help of the DIA, the Defense Intelligence Agency). The Communist revolution in China changed the U.S.’ attitude to its wartime ally. Indeed, China emerged as a “threat” to the U.S. political elite, particularly surrounding disputes over Taiwan and other islands in the South China Sea. And so, Japan would become a bulwark of American foreign policy. The CIA financed the country’s single party regime, which was a mirror image of Soviet policies in the former German Democratic Republic. “For thirty years, the Liberal Democratic Party successfully prevented any alteration in political power and dutifully legitimated Japan’s status as a satellite of the United States” (p.24). In turn, the country ratified the Japanese-American Security Treaty, which kept American troops in the country. The Liberal Democratic Party ruled uninterrupted between 1955 and 1993—with the CIA sending covert cash to the conservative party at least during the 50s and 60s. By the 1990s, Japan was the world’s second richest country, “but with a government remarkably similar to that of the former East Germany” (p.24). The U.S. pursued similar policies in the Philippines, an American colony until 1946, and a vital staging area for the U.S. bombing campaign in Vietnam in the 1960s. As a side note, in pursuing the war in Vietnam in the early 1970s, President Richard Nixon “ordered more bombs dropped on rural Cambodia that had been dropped on Japan during all of World War II, killing at least three-quarters of a million Cambodian peasants and helping legitimize the murderous Khmer Rouge movement under Pol Pot” (p.12). Without the U.S.’ Vietnam-era savagery “he could never have come to power in a culture like Cambodia’s”. South Korea, likewise, was a proxy in a greater war against communism, which visited the peninsula after the territorial contradictions left in place after World War II reared their ugly head. The Korean War was nominally a civil war: fought between those in the South that had collaborated with the Japanese colonialists, and those in the North who had fought against them. It was also a war between China and the U.S. played out on Korean soil. The North Koreans characterize it as a war of liberation against American imperialism, whereas the U.S. characterises it as an international conflict in which the North invaded in the South. Regardless of which perspective one adopts of the war (which eventually descended into World War I style trench warfare around the 38th parallel), South Korea became a client of the U.S. As Johnson argues, “South Korea was the first place in the postwar world where the Americans set up a dictatorial government” (p.25). After the 1953 “truce”, the fledgling government consisted largely of former Korean collaborators with the Japanese colonialists, a fact that was always secondary to “containing” the USSR in North Korea. The U.S. subsequently supported decades of army generals in the country until 1993, when the Kim Young-sam administration was elected after popular street protests. South Korea’s status as a “miracle economy” and financial rise (and fall) is directly related to its status as a satellite. The U.S. was less rigid in its imposition of economic reform in East Asia than the Soviet Union’s imposition on its seven “people’s democracies”. It did, however, insist on the institution of private property and opposed steps toward the nationalization of industry. It also opened its market to South Korea and Japan, leading to fantastical levels of export-fuelled growth. The U.S. financially patronised Japan in many ways (p. 184), even though its economy was predicated on a “third way” between naked capitalism and socialism. Japan was always seen as a Cold War ally rather than economic competitor, even as trade deficits soared. The global economic meltdown of East Asia in 1997 was partly a result of the trade deficit with the U.S. For more than 40 years the U.S had won and retained the loyalty of its East Asian satellites, fuelling their export-intensive growth. Over time, this produced excess capacity, a lack of equilibrium between supply and demand across the Pacific, and the world’s largest trade deficit in the U.S. (which, in turn, relied ever more on finance capitalism). And the whole system caused great hardship for the average American worker—with economic blowback manifesting itself as a decline in real incomes. The system worked so long as the U.S. market was bigger than its dependencies. But Japan’s economic size soon exploded. And so too did the whole neo-colonial economic machinery inherited from the Marshall Plan. Johnson thus reverses Lenin’s classic formulation: “Marx and Lenin were mistaken about the nature of imperialism. It is not the contradictions of capitalism that lead to imperialism but imperialism that breeds some of the most important contradictions of capitalism. When these contradictions ripen, as they must, they create devastating economic crises” (p. 233). Although not a focus of the book, Johnson does mention the seeds of blowback sewn in Latin America, from Nicaragua to Chile. The U.S. became increasingly concerned with the continent throughout the Cold War. “Americans supported a series of activities that ranged from the widespread use of paramilitary death squads in countries like El Salvador to military-directed genocidal campaigns in Guatemala, seriously compromising American rhetoric about human rights for the rest of the country” (29). The most common explanation for these atrocities is the discredited “domino theory” and the necessity of “containing” instability. Much of these stories of American intervention are well known. In Guatemala, 1954, the Eisenhower administration planned and the CIA organized and funded the coup that overthrew a president who had proposed only moderate land reforms, but was considered to be a threat by U.S. corporations. Blowback from this led to a Marxist guerrilla insurgency, particularly throughout the 1980s, and so to CIA- and Pentagon-supported genocide against Mayan peasants. Around 200,000 peasants were killed in the Guatemalan Civil War (which stretched from 1960 to 1996). The U.S. had trained the government’s officer corps responsible for much of the genocide, sometimes at the infamous “School of the Americas”. The book is good place to start for documenting the range of U.S. Cold War misadventures in East Asia. Despite missing some of the contemporary manifestations of blowback, the care and historical detail Johnson pours upon his thesis remains illuminating. With reference to the network of bases that the U.S. military maintains, and the system of satellites it still defends, Johnson’s words remain as urgent as ever: “For over forty years, the policies needed to maintain these client states economically, while protecting and controlling them militarily, produced serious unintended consequences, most of which Americans have yet to fully grasp” (226). As I have elsewhere written about, the shift from a baseworld to a droneworld is one such “unintended consequence”. The every existence of empire produces contradictions, of course, and always has. One such contradiction rests on the desire to expand and the resources required for expansion. “A classic mistake of empire managers is to come to believe that there is nowhere within their domain – in our case, nowhere on earth – in which their presence is not crucial. Sooner or later, it becomes psychologically impossible not to insist on involvement everywhere, which is, of course, the definition of imperial overextension” (p.229). Like Madison’s cautionary echos from history, the late Chalmers’ Blowback remains essential reading. A fiery beginning to his trilogy. This entry was posted in Book Reviews, Chalmers Johnson, History of Drones and tagged Blowback, Chalmers Johnson, Cold War, Empire, Guetemala, Japan, Okinawa, South Korea, Soviet Union, U.S., War on Terror. Bookmark the permalink. I read this book when it was first published. It’s a very rich source of info on American foreign policy. I’ve decided to go back and read it again, especially since there’s an updated edition. It’s nice to know someone else who has read it, too!